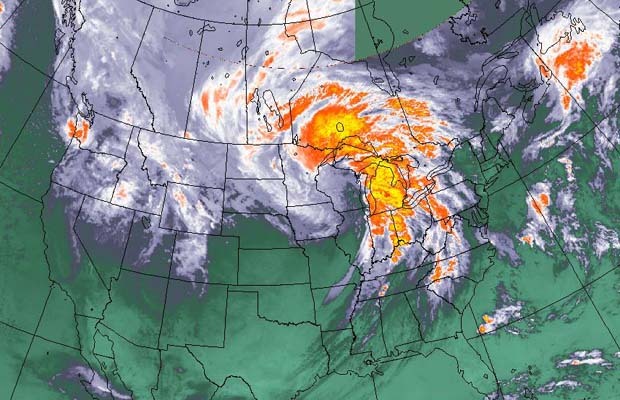 An intense autumn storm, known as a “weather bomb” (a low-pressure system that develops rapidly), has blown across the Prairies and Midwestern U.S. and has moved into Ontario. As much as 20 cm of snow and winds gusting to 80 km/h impacted parts of Saskatchewan. Winds were also a problem in Ontario with gusts of 100 km/h reported in Sudbury and gales strong enough to blow transport trucks off the road near Chatham. Forecasters say the storm was a little stronger than the one that sank the Edmund Fitzgerald, a freighter, to the bottom of Lake Superior in 1975.